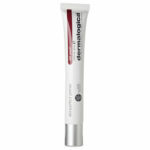 Dermalogica MAP-15 Regenerator dramatically improve skin firmness and clarity by delivering the highest concentration of Magnesium Ascorbyl Phosphate (MAP) – a stable form of Vitamin C that stimulates collagen formation in the skin while providing antioxidant protection, inhibiting melanin formation and inhibiting MMP enzymes that contribute to collagen degradation. The effective blend of White Tea, Hyaluronic Acid, Glucosamine, Phospholipids, Algae and Yeast extracts helps stimulate collagen production, brighten skin tone, and neutralize free radicals to dramatically increase hydration, firmness and elasticity while helping to prevent the signs of aging caused by Advanced Glycation End-products (AGEs  a damaged by-product of sugar/protein reactions in the skin). Silky emulsion glides gently over skin for efficient application, especially around the delicate eye and mouth area. 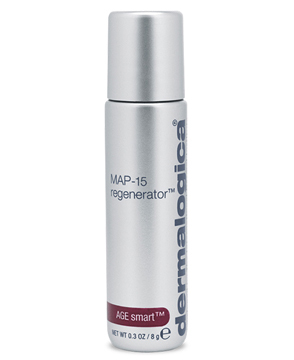 Directions: Dispense a small amount of Dermalogica AGE Smart MAP-15 Regenerator onto fingertip and apply directly to areas where signs of aging are prominent. For all-over brightening and firming, mix a pea-sized amount into moisturizer prior to appllication. 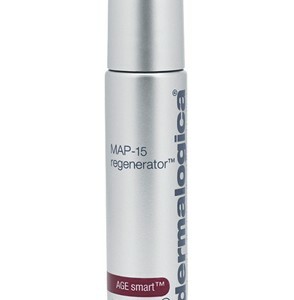 Dermalogica MAP-15 Regenerator Ingredlents: Water (Aqua), Magnesium Ascorbyl Phosphate, Propylene Glycol, Polymethylsilsesquioxane, Silica Dimenthyl Silylate, C9-15 Fluoroalchol Phosphate, ,Camellia Sinensis; Leaf Extract, Glycerin, Urea, Saccharide Hydrolysate, Magnesium Aspartate, Glycine, Alanine, Creatine, Sodium Hyaluronate, GIucosamine HCI, Algae Extract, Yeast Extract, Saccharide Isomerate, Phospholipids, Hydrogenated Lecithin, Phenoxyethanol.